The Magic Chef brand, once known as the American Stove Company, was started in the 1850’s by German immigrant John Ringen. Through the course of the company, Magic Chef turned from a simple tinshop to a large corporation selling home appliances. The brand places emphasis on convenient appliances which make meal preparation and kitchen chores much easier. If your Magic Chef appliance causes you an inconvenience by breaking then make sure to call Action Appliance Repair. Since 1961, Action Appliance Repair has been proudly serving customers throughout the area. We know just how important your appliances are to the running of your home. Our team of qualified technicians is ready to help get your appliance up and running like new again. Year after year our clients return for all their repair needs. With over 50 years of experience, Action Appliance Repair is the service center you can trust to handle your Magic Chef appliance with the care it deserves. The next time your Magic Chef product is in need of a repair, call us toll free at 866-611-4479. 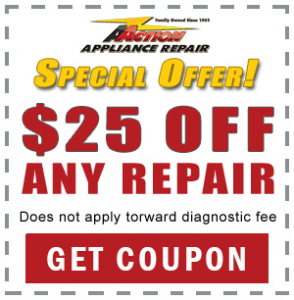 Action Appliance Repair ensures you get the best price and service in town. Your service call is absolutely free with each repair we make. When your Magic Chef appliance is in need maintenance or repair, then make sure you call Action Appliance Repair for service you can depend on. Our team of highly trained and courteous technicians leaves you with a peace of mind that your appliance is in the right hands. Aside from our exceptional service, we also proudly offer our customers a 5 year pro-rated parts warranty. So what does calling Action Appliance Repair for your Magic Chef appliance mean for you? We waive the fee of our service call if we repair your Magic Chef appliance. You won’t owe us anything if we visit and are able to repair your appliance.